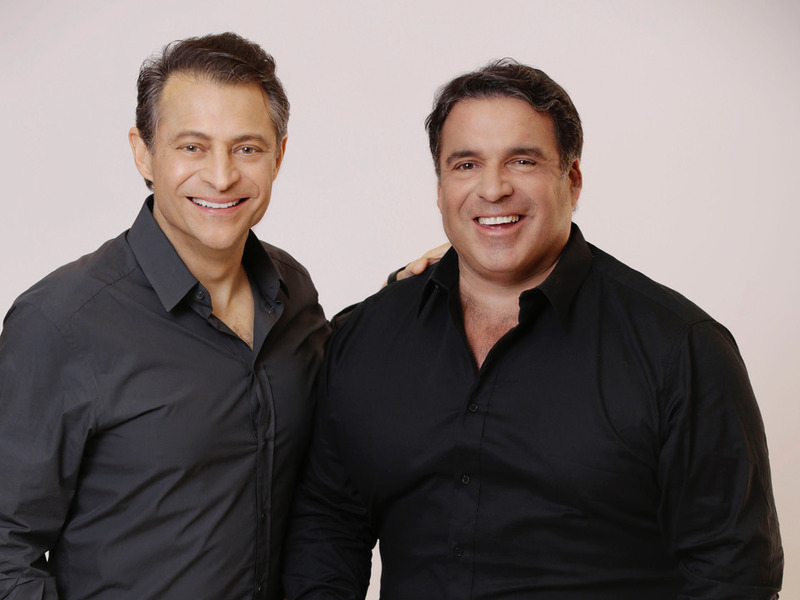 Nadine Rupp/GettyPeter Diamandis is best known for his work in space. He is the executive chairman and founder of the X Prize Foundation, the executive founder of Singularity University and International Space University, and the co-executive chairman of Planetary Resources, among other organisations. He told Business Insider’s podcast, “Success! How I Did it,” about how he became the man behind companies making science fiction come true: the X Prize Foundation, Singularity University, Human Longevity Inc.
He’s dedicated himself to “opening up space,” making space travel accessible to not just the government, and increasing the human life span. His latest project, undertaken with Bob Hariri, is called Celularity, and it’s finding ways to use stem cells from placentas to boost exponentially the body’s ability to recover from illness and injury. 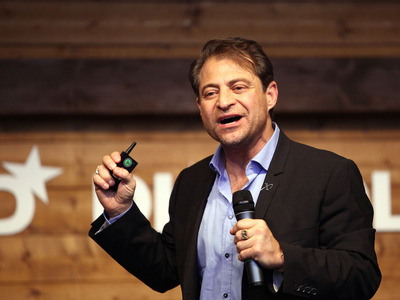 Peter Diamandis: And I remember it was the Apollo program that was at the top of my consciousness. I clipped out every article; I read every article. And then “Star Trek” came on. Apollo showed us what we could do now, and “Star Trek” showed us where we were going. And I can honestly say, everything I’ve ever done in my life is a result of that childhood passion, and that relentless drive to want to make those dreams come true. Rich Feloni: Did you have “Star Trek” posters in your room? Diamandis: Oh yeah, “Star Trek” posters. I remember I had a set of 3-by-5 cards with every star log that Captain Kirk had recorded, you know, Stardate entry. I had every Apollo mission. I had filing cabinets full of clipped articles. And then my friend Billy Greenburg and I would build Estes Rockets. Diamandis: Yeah, one thing that I was proudest of was we won first place in the Estes design contest. And so we built all the rockets you get from Estes. Then we got raw parts, started building our own. Then we started ordering chemicals. This is back in the day where you could actually order potassium perchlorate, potassium nitrate, magnesium, sulphur, and charcoal – and not be a terrorist! 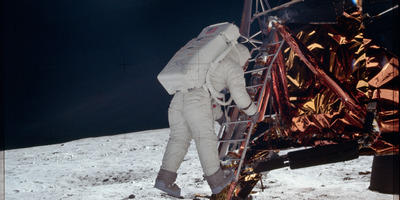 NASANASA’s 1969 Apollo 11 mission to the Moon developed a passion for space in a young Diamandis. Feloni: So were your parents very strict? Did they give you an option like, “This is what you have to do with your life to be successful”? And so there was this split that occurred in my life, where half of me, academically, was pursuing medicine, all of that, and the other half was pursuing this passion of space. And that’s really continued. I finally reintegrated myself, so to speak, now, in the past decade. But it was always both sides of the coin. Diamandis: It was fine. I wanted to make my parents happy. I laughed and I’d say, “I went to medical school.” When I finally got my diploma, I created some colour photographs of them, colour copies sent to my mum and my dad. And then I went off and started my rocket companies. So that was my pursuit. Diamandis: Well, now, I think of myself as a parallel serial entrepreneur, and I think of entrepreneurship as my art form of creating, launching, and helping drive amazing companies. And so, I’ve had three parts of my life, three segments that I’m very proud of, that are self-consistent. One is opening up space. The other has been really supporting entrepreneurs to take moonshots, and that’s the X Prize Foundation. You know, we’ve launched $US150 million in prizes to incentivise teams to do incredibly crazy big things. And then Singularity University, where we’re supporting entrepreneurs to take billion-person-impact moonshots. And so that’s one part. Feloni: And when you’re taking such an ambitious approach to life, and you’re considering how your parents instilled this discipline in you, have you passed that on to your two sons, your twin 6-year-old boys? 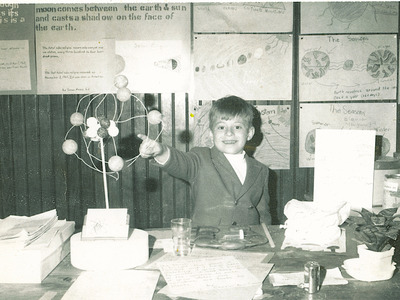 Courtesy of Peter DiamandisDiamandis loved science from a young age. So I’ve thought about this a lot, and the realisation was, there are three things that I think are important right now for anybody to teach their kids. I don’t care if they’re 3 years old or 23 years old. Number one is an obligation to help them find their passion. And for me, my passion was space and not medicine early on. I’d love if they followed my footsteps on any of these areas, but what’s more important is for them to find their passion. And to support them in that passion, because when they find that passion, they will self-educate, like I did in space. It drove me more than my parents could drive me; my own passion drove me. But it was my passion. So what’s their passion? The second thing is helping them remain curious. And I talk about this because I think curiosity is the single most important attribute for success. We’re heading toward a world in which you’re going to be able to know anything. A world in which there are trillions of sensors and AI-integrated layers, and imaging from drones and satellites, and augmented-reality glasses and everything. So we’re going to enter a world where you could ask any question and get an answer. And so when I drop my kids off at school, when I’m there, I say, “Ask great questions today.” And when I pick them up, or when they come home, it’s like, “What questions did you ask? What questions do you have for Dad?” Getting them into this comfort level of asking crazy questions. Because I think that’s the differentiator. The third, final element that I think is important is grit. It’s not giving up. And so, there’s a motto in the household of saying, “We never, ever, ever, ever give up.” And I think a lot of my successes over the years have been these “overnight successes” after 10 years of hard work. Feloni: – your whole life has been put into it. Diamandis: Yeah. So every single company is capitalising on either my hard work or my partner’s hard work, right? Diamandis: Yeah, so, the journey began in December ’93. I remember that. I was visiting my parents for Christmas, and a dear friend of mine, Gregg Maryniak, gave me a copy of [Charles A.] Lindbergh’s autobiography called “The Spirit of St. Louis.” And I was reading the book, and I had no idea that Lindbergh crossed the Atlantic in 1927 to win a prize. I thought he did it on a whim. But in fact, a Frenchman, Raymond Orteig, living in New York, had offered up a $US25,000 prize. And Lindbergh, the most unlikely guy, pulls it off and becomes massively famous – and opens up aviation, more importantly. Because I was frustrated by this point, that NASA had not fulfilled on its missions. I was no closer to going into space. And so I said, “Maybe a prize to incentivise private investments and private exploration of space.” So it was at $US10 million for the first team to build a three-person spaceship, carrying three adults, up 100 kilometers, landing, and then, very importantly, building a reusable ship to go again. Eleven years later, it finally happens. Burt Rutan builds SpaceShipOne backed by Paul Allen‘s funding, and October 4, 2004, wins the prize. And I remember that moment. I have a mental image of what’s going on. The ship had just gone to space successfully, against all the odds, and landed. And I felt like I was at the top of a mountain I had just climbed for 11 years. I remember, when I looked around, all I saw were higher mountain peaks. So it’s this interesting realisation that it is the journey, not the destination. Feloni: Did you give yourself any time to savour that moment? Or was it almost a letdown in a way? Diamandis: I don’t think it was a letdown. I mean, it was a relief. One of the things that we were dealing with was human lives. And it was very possible that it could’ve been a tragedy and loss of life there, so that was a relief. The fact that the prize was won – we had set a deadline of December 31, and this is October 4, and there’s two months left of the money, which was backed by an insurance policy that would have vaporized. Feloni: Exactly. And didn’t that spacecraft go have a spot in the National Air and Space Museum next to the Spirit of St. Louis, which was Lindbergh’s plane? Diamandis: So, in the Milestone Gallery Hall, that Boeing sponsors, number one, there’s the Apollo 11 lunar lander. It’s a backup. The actual one’s on the Moon, obviously. But then you see Lindbergh’s Spirit of St. Louis. You see the Bell X-1 that [Charles E.] Yeager broke the sound barrier with, the X-15, and SpaceShipOne, the first private vehicle to go into space. Diamandis: Oh, if I let myself, the 9-year-old becomes very proud. But when I look at all of those amazing vehicles, I think about all of the hardship, divorces, the lost jobs, centuries of work, the crazy risks that we’re taking, and realising that all of these amazing success stories have had their own “overnight success” story after 11 years, or 10 years, of hard work. You have to give credit to the thousand projects that almost got there that didn’t as well. Feloni: So when you see a big success, you’re always imagining the countless lives behind it? Diamandis: Oh, yeah. None of this stuff is simple. It all takes extraordinary passion, dedication. And a lot of times, it doesn’t happen. And you have to pick up pieces and start again. Courtesy of Peter Diamandis.Diamandis, right, received both a master’s degree from MIT’s AeroAstro program and an MD from Harvard Medical School. Feloni: When you were at Harvard Medical School, you founded the International Space University. And I’m just wondering, regardless of how much time you had spent on that, did you ever sleep? It seemed as if you were just never stopping. Diamandis: So here’s the challenge. So I’m at MIT as an undergrad, and I’m studying molecular biology as premed. But on nights and weekends, I’m at the manned vehicle lab doing research on space. And I’m running SEDS in my fraternity dorm room. Because my heart, my soul, were in the space world; my mind, and my sort of parental obligation, if you would, were in medicine. 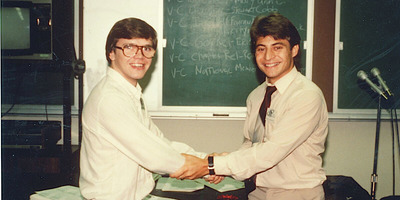 Diamandis: SEDS was Students of Exploration and Development of Space, that was my first group. It was a national, then a global student space organisation. And then I go to medical school – very proud I got into a joint MIT-Harvard program. And while I was there, one of the ideas that my dear colleagues Todd Hawley and Bob Richards came out of SEDS for was this idea of a space university. And it was such a gripping idea, and I loved the startup. I loved the energy of the creation. And I remember, during my third year of medical school, during your rotations, I would go and I would volunteer for the nighttime emergency-room rotations, which would start at 10:00 p.m. and go till 6:00 a.m. And then I would go and sleep from 6:00 a.m. until noon, and then I’d go to the office from noon until 10:00 p.m. And that was my cycle. But when I was in medical school, I got called to the dean’s office one day – and I had bought one of those Motorola brick phones – and I would go out of surgery, and I would call the office and check what’s going on. And my dean was like, “Peter, what are you doing? You’re a bright kid. Your interns are telling me you’re not paying attention, you’re not focusing. Do you want to graduate?” I’m breaking down in tears right now, and I’m saying, “Yes, I want to graduate. I promised my parents I would graduate.” And I fessed up on everything that was going on with ISU and my launch company, International MicroSpace. And I said, “We’re doing engine development tasks and all of this.” And he goes, “OK, all right, here’s the deal: If you pass part two of the boards, and you promise never to practice medicine, I’ll let you graduate.” So he kept his end of the bargain, and I kept mine! Samantha Lee/Business InsiderDiamandis is keeping a close eye on the potential for genetic modification. Diamandis: This is the most exciting time ever to be alive. Sensors, networks, AI, robotics, 3D printing, synthetic biology, AR, VR, blockchain, cellular medicine – all these technologies are transforming the world. And I think about this and truly believe we’re about to transform the human race in not 100 years, not 50 years, not 30 years – I think it’s the next 20 years. 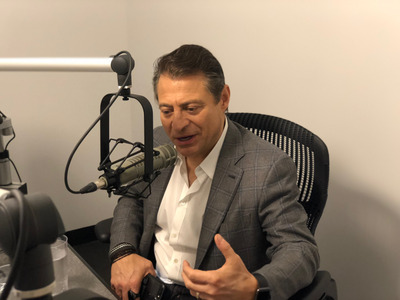 I’m here in New York right now with my brother and my dear colleague, Dr. Bob Hariri, who is the CEO and founder and chairman of Celularity. And Celularity is a company that’s commercialising cellular medicine derived from the human placenta. It’s the richest source of stem cells and amino-active cells that have the potential to extend the healthy human life span as one of the attributes. And also combat cancer, autoimmune disease, and many others. I’m 56 years old right now. I feel still like a 9-year-old kid. I actually feel like a 29-year-old kid most of the time. But I want to see a next 30, 40 years. Courtesy Elizabeth Lippman for CelularityDiamandis with Bob Hariri. Clearly, it’s either an engineering or a software problem. Or, you know, hardware or software problem. And I set a ridiculous goal of 700 years because, frankly, if you could live 150 or 200 years, you’re then intercepting extraordinary technologies, nanotechnologies, and so forth. So, I don’t know, but I do think of my children being able to consider an indefinite life span. Diamandis: Yeah, I think modern medicine will talk about living to 100, living to 120. The longest-lived humans today are late 120s – 126, 128. And we’ll find out how to do this, how to extend the life span. We’re doing extraordinary things in AI and nanotechnology. And so it’s just the beginning. People have a tendency to extrapolate the future based upon the past, but we’re in a period of exponential growth. And so I don’t think we can really know how powerful we’ll be in 10 or 20 years. Diamandis: So if you look at the numbers and the trends, the answer is no. What we’re seeing around the world is this massive uplifting of humanity. We only have to go back 100 years ago, where it’s the king and the queen on the hilltop and then the rest of the world in poverty. It was a couple of haves and all the have-nots. Today, we’re seeing this massive increase in the middle class. We’re seeing, globally, the per capita income for every nation triple. The life span has doubled in the last 100 years. We’re going to double it again. We’re seeing the cost of food globally drop thirtyfold, fortyfold, the cost of transportation hundredfold, communications millionfold. And we’re at a point at which, in the next 10 years, we’re going to take all of the human race out of extreme poverty. It’s just uplifting. So when I speak about this, I talk about, we’re going from a world of have and have-nots, to a world of haves – and yes, there’ll be super-haves. But I believe we’re heading toward a world where every man, woman, and child will have access to the best education, the best healthcare, water, food, energy. XPRIZE/YouTubeSpaceX and Tesla CEO Elon Musk is funding a $US15 million XPRIZE competition for developing learning software for children living in extreme poverty in Tanzania. I’m holding up a mobile phone here. Today, a child in Mumbai on a smartphone or feature phone, with access to Google or Baidu, has access to the world’s information at the same level as Larry Page, the CEO of Alphabet. This complete democratization of access to information – this is also going to happen in healthcare and education. I’m very clear about that. We have an amazing global learning XPRIZE today, funded by Elon Musk, $US15 million. We had 700 teams enter this XPRIZE. We asked them to build a piece of Android software that could take a child in the middle-of-no-place, from illiteracy to basic reading, writing, and numeracy. Eighteen months on the road – no school, no literate adults. Google gave us 8,000 tablets. And we had 700 teams enter. We narrowed it down to eventually the five finalists. We put those five finalists on the tablets, and we’re in villages throughout Tanzania testing it on children, their families, the villages, to uplift them. 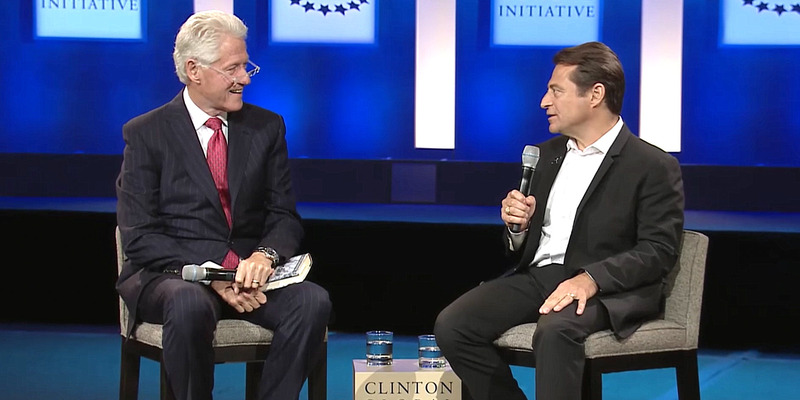 Feloni: Well, just a few years ago, former President Bill Clinton introduced you at a Clinton Foundation event. And basically portrayed you as “This is a beacon of optimism.” Was that validating for everything you’re doing here? Clinton Global Initiative/YouTubeFormer US President Bill Clinton speaks with Diamandis in 2014. And I looked at the data. And I went on a diatribe about how most of the news media is focused on all the negative stories all day long, because we pay 10 times more attention to negative news than positive news, because we’re evolutionarily advantaged to do that. A piece of bad news 100,000 years ago meant you were dead. Your genes were out of the gene pool. But the data is extraordinary. And, you know, there’s another amazing thinker, Steven Pinker, from Harvard, who wrote a book called “The Better Angels of Our Nature.” And Steven will show you that we’re living during the most peaceful time ever in human history. Feloni: Even when it doesn’t feel like it. Diamandis: And people go, “What? Are you nuts?” Well, yeah, but when you’re watching the negative news all the time, and every shooting – God forbid, we’ve had some horrific shootings around the world – is brought to you in living colour over and over and over again on every device you have, you feel like you’re being just under barrage. But we forget about way the world was 100 years ago or 200 years ago. It was brutal – far worse than it is today. We’re living in a much more civilized world, and the data pans that out. Feloni: On that note of optimism, you gave a TED talk where you explained this story of taking the physicist Stephen Hawking into zero-g. And I think that’s just a fantastic story, could you explain that? Diamandis: That was one of my favourite moments. So, back when I was at MIT, as a grad student, I had some friends of mine who were getting on NASA’s zero-g aeroplane. It’s euphemistically called the “vomit comet.” We don’t call it that, but it’s a parabolic aeroplane where you get a chance to be weightless for 30 seconds at a time. And I so badly wanted to do that. It was my chance to taste a little bit of weightlessness in space. And I could not get on. I begged everybody. I volunteered to be a guinea pig. I had met Stephen Hawking through the XPRIZE. And he said, “Can you get me into space?” And I said, “I can’t do that right now, but I can give you a chance to fly on zero-g.” I thought the idea of the world’s expert in gravity getting a chance to experience zero-gravity would be amazing. And he said, “Sure.” And I said, “Let’s make it a fundraiser for Lou Gehrig’s disease, ALS.” Which is what he has, a variant of that. And he said, “Yes.” And we announced it the next day, and said, “OK, we’re going to fly Professor Hawking into zero-g!” And then we had news. And so we then proceeded. Took us a couple months to get letters from his doctor and from a series of doctors saying that Professor Hawking could do this. And they said, “OK, it’s your risk. Go ahead.” And so we ended up flying him at the Kennedy Space Center. We did a practice flight the day before. 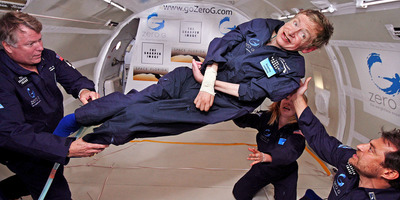 And we had a chance to fly Professor Hawking into zero-g. If you Google Hawking and zero-g, you’ll see these photos of him just smiling. He had a few muscles he could control in his face. One end is Byron Lichtenberg; I’m on the other end. x-ray_delta_one/flickrDiamandis, right, helps guide the physicist Stephen Hawking on a zero-gravity flight in 2007. And it was just a momentous event for me to give this man, who so desired this, and he had such an amazing experience, and I’m so happy to have had a chance to deliver that to him. And, by the way, on the tail of that, with funding from, I think, Northrop Grumman, we flew children who were wheelchair-bound, who had never walked, into zero-g.
Feloni: – kind of terrified, too. Diamandis: I think it’s more the 9-year-old that drives it. All of this stuff is hard and impossible until you make it happen. And it’s not giving up. I guarantee you, Zero G died a thousand deaths until it was finally approved with the FAA. Airbus telling me, “No. Give up, give up.” The XPRIZE – the same thing. There were moments in time where I didn’t have the dollars to continue, and people said, “Oh, it’s never going to happen.” For me, I was pissed off at NASA not giving me the chance to fly into space, and how do I commercialize it? Diamandis: Oh, God. Ultimately, it’s being a great dad. It’s underlying for me, so important now than ever before. I can’t not think about them. I’m so thankful for what I have right now because of my parents, what my dad and my mum gave me. So that becomes sort of core, when everything is said and done. And then, for me, my massively transformative purpose is to inspire and guide the transformation of humanity on and off the Earth. I think we’re going to see a transformation of the human race. We’re going to become something much more than we are. There are billions of dollars being invested right now on brain-computer interface, with ultimately interfacing humans with AI. We’re seeing CRISPR-Cas2. 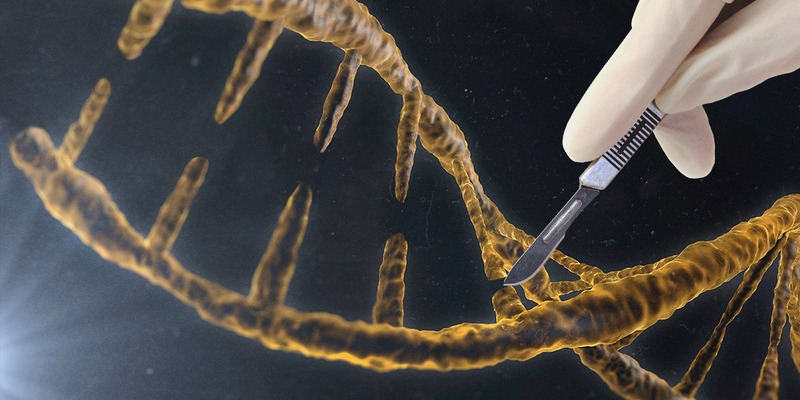 We’re seeing gene editing, where we’re beginning to edit our own genome. We’re seeing AI giving us new tool sets. So we’re at this massively steep part of the curve, and we’re going to be re-evolving. I think the human race and society – how we govern, how we raise our kids, how we think, how we communicate – is going to fundamentally change well within the next 30 years. And so being part of that transformation, it’s what I think about; it’s what guides and what drives me.